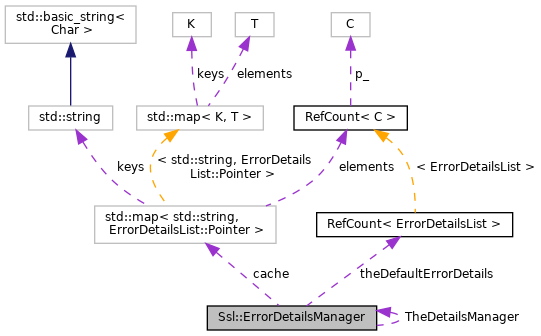 It is used to load, manage and query multiple ErrorDetailLists objects. Definition at line 59 of file ErrorDetailManager.h. Definition at line 86 of file ErrorDetailManager.h. Definition at line 97 of file ErrorDetailManager.cc. Definition at line 116 of file ErrorDetailManager.cc. Definition at line 104 of file ErrorDetailManager.cc. References debugs, HERE(), and NULL. Definition at line 166 of file ErrorDetailManager.cc. Definition at line 172 of file ErrorDetailManager.cc. Retrieve error details for an error. This method examine the Accept-Language of the request to retrieve the error details for requested language else return the default error details. request the current HTTP request. Definition at line 125 of file ErrorDetailManager.cc. References Http::ACCEPT_LANGUAGE, debugs, Ssl::GetErrorName(), HttpHeader::getList(), RefCount< C >::getRaw(), Http::Message::header, HERE(), TemplateFile::language(), TemplateFile::loadFor(), NULL, and strHdrAcptLangGetItem(). Definition at line 82 of file ErrorDetailManager.cc. Definition at line 91 of file ErrorDetailManager.cc. Definition at line 87 of file ErrorDetailManager.h. Definition at line 88 of file ErrorDetailManager.h. Definition at line 91 of file ErrorDetailManager.h.